HMS Hood. Royal Navy photograph. How can anyone pick great capital ships? Great in what way? Speed? Armor? Firepower? War record? In this case, no to all of the above (although you will not find any slow ships here, or any that embarrassed themselves in service). My "great" is a purely subjective, personal evaluation based primarily on design and aesthetics. That's correct, these are the ships that just seem 'right' to me! I have purposely avoided all pre-Dreadnoughts, and the great number of World War I capital ships, focusing instead on ships completed from 1920 onward. Most of these ships, in fact, served in World War II. Some of them survived that conflict, some did not. It is intended that this article should serve as a conversation starter for students and admirers of the capital ship. So now, on to the great capital ships. #1. H.M.S. HOOD - No point in being coy about it, the Hood was, to me, the greatest of them all. I have a weakness for battlecruisers, and the "Mighty Hood" was the ultimate. The biggest and boldest of all battlecruisers. Completed in 1920, she was the forerunner of all the World War II fast battleships, the evolutionary stage where the battlecruiser merged with the battleship to become the new type later known as the "fast battleship". And, despite the fact that the Bismarck blew her up with her fifth salvo, the Hood represented good value in her time and had a dramatic influence on the subsequent capital ship designs of all nations. Armed with 8-15in/42 (Mk. II) guns (4x2) and protected by a 12 inch belt, the 860ft long, 41,200 ton, 32 knot (as built) Hood ruled the seas from 1920 to 1940. Even today, when I see a decent model or photograph of the Hood, I cannot help being struck by the feeling that this huge, graceful, racehorse of a ship was what the word "capital ship" was invented to describe. #2. H.M.S. VANGUARD - The battleship that just missed World War II, commissioning in 1946, is my choice for the best balanced, all around champion, fast battleship. The 44,500t, 814ft, 30 knot Vanguard, with her 14 inch belt, represents a fine balance of qualities. Never the absolute best in any category, but consistently among the best in every important characteristic: speed, protection, battery (main, secondary, and AA combined), fire control, seaworthiness, habitability, range, and so on. Plus, from her graceful forward sheer to her transom stern, she just looks 'right' from any angle. Her four 15 inch main battery gun turrets and twin funnels give her the symmetrical profile that epitomizes great design. You can argue the relative benefits of 4x2 versus 3x3 main battery layouts to exhaustion (and I have, from both sides), but it is hard to deny that the former usually results in a more balanced profile. It may be a measure of Vanguard's true greatness that her most frequently mentioned "deficiency" is her Mk. I(a) 15in/42 main battery guns. Think about it, the artillery that may well be, on balance, the most completely satisfactory in the long history of battleship guns, is the nearest thing to a flaw that can be cited in Vanguard's design! Vanguard was sent to the breakers in 1960. #3. RM. BISMARCK / TIRPITZ - The German giants completed in 1940-41 have their admirers and detractors, but it is hard to deny their overall balance and handsome appearance. Big (Tirpitz = 42,900t), powerful (how come nobody criticizes these ships for mounting 8-15 inch guns? ), fast (29kt), well protected (12.5in main belt), long range ships that proved incredibly hard to sink; they were also among the best looking battleships of their era. Again, the symmetrical 4x2 main battery layout provided a balanced silhouette. Even though they are single funnel ships, their superstructure and secondary battery layout nicely complemented the rest of the design. From directly overhead their 814ft hulls looked a little pudgy, but their great 118ft beam contributed to their steadiness and superior underwater protection. 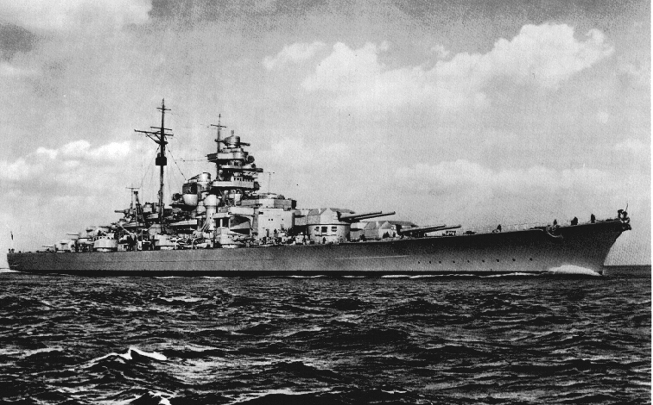 The Bismarck is most famous for ending the Hood's reign as the worlds most powerful warship, before being overwhelmed herself, a few days later, by units of the British Home Fleet. Ironically, the British battleship Rodney, a ship that would have made my "ugliest battleships" list had I written one, was instrumental in defeating the handsome Bismarck. Proving, I guess, that aesthetic value and military value have no particular correlation. Tirpitz was sunk at her mooring late in the war by RAF heavy bombers using 12,000lb bombs. #4. U.S.S. WASHINGTON / NORTH CAROLINA - The first (commissioned in 1941) of the numerous American third generation fast battleships, this class has always seemed the best balance of qualities to me. With their 9-16in/45 guns (3x3), they emphasized firepower. But they also had speed (27 knots), a 12 inch belt, excellent fire control, long range, and good underwater protection. Their tall conning tower, balanced superstructure, and twin funnels gave them a symmetrical and powerful look. The longer hull (729ft), graceful forward sheer, and twin funnels distinguished them from the next (short hulled) class. To me, the 37,484t Washingtons are more aesthetically pleasing than even the elegant Iowa class, better balanced and more conservative. 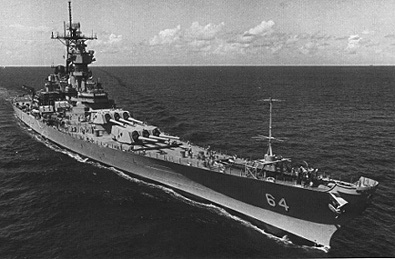 North Carolina was the only treaty battleship to be refitted and retained in commission after the end of WW II. After de-commissioning, both were held in reserve until 1961. North Carolina was preserved as a war memorial, and can still be visited today. Since this is an opinion piece anyway, I will go even farther out on a limb and state that I have always felt that these two ships were superior in fighting qualities to all of their contemporaries in other navies except the giant Yamato's, and that includes the KG V's, Littorio's, Richelieu, and even the much larger Bismarck class. Washington's fighting capability was demonstrated when she met the Japanese battlecruiser Kirishima in a wild night battle off Savo Island (see my "Naval Gunfire" page for a spectacular photo of Washington firing on Kirishima). Kirishima had just disabled the new battleship U.S.S. 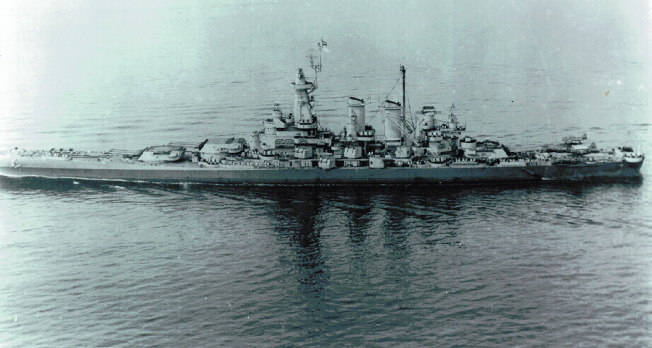 South Dakota with her 14 inch guns when Washington opened fire on her using a mix of radar and optical fire control, and in short order left Kirishima burning and sinking. Washington thus joined the very short list of capital ships which won a gunfight against others of her kind. #5. U.S.S. IOWA / NEW JERSEY / MISSOURI / WISCONSIN - The famous 45,000t (nominal) Iowa class were the last active class of battleships in the world. Between them, they are veterans of four wars (WW II, Korea, Vietnam, and the Gulf). Completed in 1943-44, no other class of fast battleships even came close to equaling their longevity. No other class even came close to equaling their speed (35 knots), either. And only the storied (and much larger) Yamato class exceeded the firepower of their 9-16in/50 guns (3x3). At the time of their last re-construction (in the 1980's) they emerged as unquestionably the most powerful surface combatants in history. Their Tomahawk cruise missiles gave them a 1,400 nautical mile (nuclear if necessary) punch, backed up by 70 nm Harpoon anti-ship missiles, and the 23 nm range of their big 16 inch guns. No other battleship in history has ever had so many ways to hurl destruction "over the horizon". It is odd that such destructive capability should be housed on what are probably the leanest, most elegant, and racy looking, of all modern battleships. Their exaggerated clipper bow, great length, and twin funnels give them a slender, deceptively fragile (their 12 inch belt was carried internally), appearance. At 887 feet, they are the longest battleships ever built, but their 108 foot beam is the same as the 729ft North Carolina class, or the 680ft "short hulled" South Dakota class. From the air, the Iowa's almost look skinny. Their unusual hull shape was the result of the enormous horsepower (212,000shp) and waterline length required to achieve their startling top speed, itself a result of their primary mission: to screen fast carrier task forces. All four were prematurely de-militarized in the early 1990's by the Clinton Administration, and will become war memorials and museum ships in various places. #6. RM. 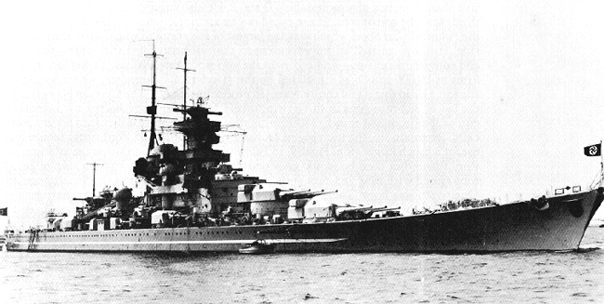 SCHARNHORST / GNEISENAU - This famous pair, commissioned in 1938-39, are not outstanding in any single specification. They are usually referred to as "small" or "light" battleships, despite their 771ft long hulls (with the "Atlantic" bow) and standard displacement of 34,841t, very close to the 35,000t treaty maximum. In fact, they were longer than, and almost as heavy as, the British King George V class or the American North Carolina class fast battleships. What makes them "light" is their 9-11in/47 guns (3x3), substantially smaller bore than contemporary battleship's guns. What they gained by this sacrifice in main battery was extensive internal sub-division, higher speed (32 kts as opposed to the 27-28 kts of the Allied ships), long range, and heavy armor (13.75 inch belt). They also presented a very handsome profile, particularly for single funnel, triple turret ships. There can be no doubt that their inferior main battery left Scharnhorst and Gneisenau at a disadvantage compared to the third generation Allied battleships. Scharnhorst's defeat by H.M.S. Duke of York off the North Cape of Norway in December, 1943 is usually cited as evidence of this. It should be noted, however, that Scharnhorst lost the gunnery duel with DOY under conditions of very poor visibility, primarily because of the latter's superior (radar) fire control. Even so, Scharnhorst was able to use her speed advantage to open the range to the point where both battleships had ceased firing. She would have escaped, except for the presence in the area of three British and one Norwegian destroyer, which were able approach Scharnhorst unnoticed (her primitive sea search radar had been knocked out in the preliminary stage of the battle by an 8 inch shell from the heavy cruiser Norfolk) and torpedo her. This slowed her down enough for DOY to catch up and re-engage. She was finally sunk by 14 inch shells from DOY, plus the gunfire of three British cruisers, and more torpedoes from the destroyers and cruisers. The irony was that, as usual, the five German destroyers escorting Scharnhorst had been detached and sent home before the battle began. The eleven inch main battery was the result of political, not naval, considerations. The Kreigsmarine had planned to rearm them with a 15 inch main battery at the first opportunity, but the outbreak of WW II intervened and the press of events made this impossible. Both ships retained their 11 inch guns throughout their careers. After she incurred severe wartime damage forward, it was planned to go ahead and rebuild Gneisenau with 6-15in guns (3x2), and a bow section extended by 10 meters. The preliminary drawings reveal that the result would have been an even more handsome ship than the original design. Unfortunately for Gneisenau, the days of the Third Reich were numbered, and her rebuild was never completed. The hulk was sunk as a blockship in Gdynia harbor late in the war. The British usually referred to these ships (incorrectly) as "battlecruisers", partly because of their 11 inch guns, and partly because they had no idea of their true size (they were listed at 26,000t for years). The Kreigsmarine, however, always classified them as battleships. Whatever you call them, they were fast, handsome, and largely successful ships. #7. I.J.N.S. YAMATO / MUSASHI - The final selection for my "great" list are the most super of all super-battleships. Laid down in 1937-38, and completed in 1941-42, Yamato and Musashi were startling in almost every specification. Displacing 65,000t, mounting 9-18.1in/45 guns (3x3), carrying a 16.1in belt, and with a top speed of 27 knots, these were the battleships to end all battleships. The great hulls were 862ft long, with a 121ft beam. Their 9.1in armored deck was supposed to be proof against a 2,000 lb bomb dropped from 15,000 feet! I have always been amused by the story of the audacity of the Japanese Naval Attache in the late 1930's, denying that Japan was building treaty breaking battleships in the 40 to 50 thousand ton range! Visually, the Yamatos looked intimidating, a perception enhanced by their huge swept back single funnel, tower bridge, and massive main battery turrets (each one of which had a revolving weight of 2,530t, the weight of a large WW II destroyer!). But, their long clipper bow and "wave" shaped deck made them seem surprisingly graceful. They were, in fact, very maneuverable, far more so than the much smaller Allied Vanguard and Iowa class. Gone were the odd visual design features, like the piled up "pagoda" bridges and "bull nose" bows, of previous Japanese battleships. Yamato and Musashi were not visually balanced like Vanguard and Bismarck, or elegant like Iowa, or perfect of line like Hood, but they had a splendor all their own, and I have always found them both impressive and attractive. Both were sunk by overwhelming American carrier air power late in the war. So, there you have it, my favorite capital ships of the period 1920 to 1990. I might have written about the "fabulous four", or the "top ten", or whatever, except that, upon reflection, I found that I especially admired the preceding seven types. Which capital ships stand out in your mind? If enough readers of this little piece e-mail me their selections, perhaps someday I will publish the consensus choices on my web page. Copyright 1997, 2016 by Chuck Hawks. All rights reserved.